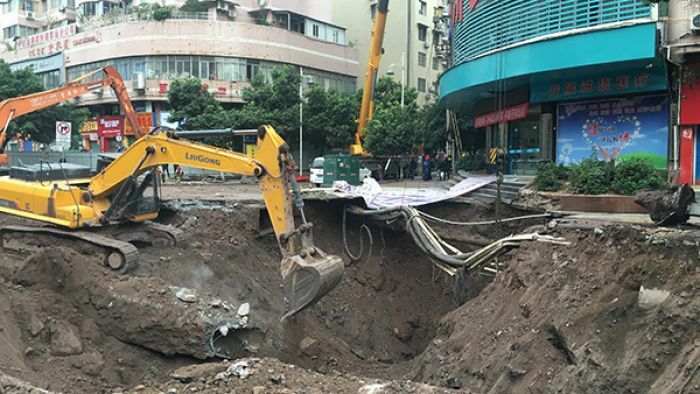 Four people have died after a giant sinkhole suddenly opened up along a busy sidewalk in Dazhou city in south-western China. The four were swallowed up by the sinkhole that opened on Sunday. Two people believed to be newlyweds were trapped for hours before they were retrieved by rescuers, but both died shortly afterwards. Rescuers had been searching for a father and son they suspected were buried 10 metres deep in the rubble, but they were found dead yesterday afternoon (local time), according to a post from Dazhou city’s Weibo page. “The bodies of a father and son were found and taken away from the scene by ambulance,” the Dazhou City post read. A young boy who fell in the sinkhole was swiftly rescued by a passerby. Surveillance video shows the ground rapidly disappearing and the victims plunging into the sinkhole. Rescuers were digging through the rubble when a second collapse inside the sinkhole almost swallowed them, footage from the scene shows. Sinkholes sometimes occur when limestone or other rock shifts or dissolves under the surface. The hole appeared near the entrance of a local hospital and stretched about three metres in diameter, according to the South China Morning Post. Efforts to rescue the trapped persons were frustrated by a complex series of pipes running underneath the collapsed area, according to the Post, and 200 households surrounding the hole were evacuated as a precaution. Authorities said a follow-up and investigation into the accident was still in progress.